When Little Divas hit bookshelves in 2006 it could have been called Lonely Divas because there simply weren’t many middle grade novels, of its kind, aimed at African American readers – a refrain repeated often here at The Brown Bookshelf when we spotlight those authors working hard to fill the slowly shrinking but still present void. There’s something both awesome and awful about being a trailblazer. There are two paths one may take – and sure there may be shades of gray in between but surely these two paths are the most obvious, either, one day you find yourself at the end of a long career looking back at your first novel, fondly, nodding knowingly about how you knew it would be “something special” in the market. Or, you find yourself left behind as the market gloms on to the up and coming, forgetting who helped open doors for them. The pages are still being written about Philana Marie Boles, author of Little Divas. She has yet to see which type of trail blazing author she’ll be, but there’s no doubt that Little Divas was among the first of its kind. So a trail she has most definitely blazed. I talk to her about blazing trails and what’s next. BBS: Whenever someone says “among the first” it’s code word for – I don’t know who was first. 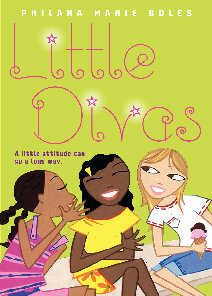 When Little Divas came out in 2006 were there any other books out there that you felt were like it? Or do you feel it stood as a “new kind of book” for young Black readers? PMB: First, thank you so much for this honor. I wholeheartedly appreciate it. When I was first inspired to write Little Divas–which was actually back in 2003 when my agent initially sold it–and when the hardback of Little Divas came out in ’06, things for young Black readers weren’t great, as you know. At the time I was doing a lot of substitute teaching, often in middle grade/junior high, and–when it came to reading books for fun–a lot of my students, young girls of color, just didn’t see themselves in books. So, sadly to me, they were reading a lot of popular adult books in addition to, of course, the mainstream books that were specifically for their age group yet did not have diverse characters. This was a clear disparity, but also one that I chose to view as an opportunity more than anything. So, no, I didn’t know of any middle grade books for our target audience at the time, and that is why I consciously, and with so much preparation and inspiration, set out to happily fill that void. That being said, however, I must point out that sometimes I do grimace at the thought of the audience for Little Divas being limited by the race of its readers. Little Divas is for all girls as should all books be written. As a society, we must support and encourage the cross-cultural experience. We need not only read books about ourselves and our own backgrounds. How then will we grow? The misfortune only occurs when all experience are not represented on the shelves, as was the case when I decided to write Little Divas and also when such efforts are not as readily embraced by the media–which is why The Brown Bookshelf is so very, very much appreciated! Little Divas is simply a story about the transition into teenage years. As the author, I’m blessed because all girls of all races have embraced Little Divas. God is good. 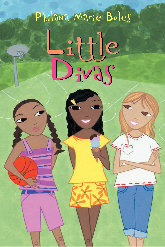 BBS: The paperback of Little Divas was released Sept 2008. Why such a long gap between hardcover and paperback? And was there any conscious effort to make the paperback cover more inclusive racially? I notice it’s different from the hardcover. PMB: Girl, at the end of the day, we really shouldn’t look at the two year time line between hardback to paperback for Little Divas as anything but a blessing. Because during those two years, Little Divas was doing exceptionally well in hardback. And now, with its paperback release, Little Divas is meeting a whole new life. Oh! And those are actually the same three girls from Ali Douglass’ awesome original artwork for Little Divas’ hardcover version. There was no change. In fact, if you look at the back of the hardcover of Little Divas, you will see that the artwork from the back of the book is now the front cover for the paperback, which I absolutely love. Much like how I grew up in the Midwest, and like the world that we live in, Little Divas was always intended to be racially inclusive. Clearly, HarperCollins was years ahead of the presidential elections and the tone of multiculturalism that we now celebrate as a country. I’m thankful to HarperCollins for taking a chance on that vision years ago when my then agent and I first approached them with my Little Divas idea. BBS: Did you have any expectations for the book’s success? If so, in your opinion were they met? Explain yes or no. If not, what were your hopes/desires/wishes for the book once it was out there for young readers? PMB: No expectations Paula, no. It’s never wise, nor is it humble, to feel entitled. What I did however, and have always done, was to just pray that God would have His way. 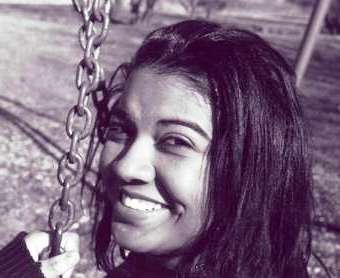 In my sincerest heart, I knew that I had written a story reflective of the things that average pre-teen girls are going through, regardless of their race. And I just wanted the book to reach its audience. From there, as you know all too well yourself, it’s really out of our control as writers. You just want the intended audience to know that the book exists, more than anything. My prayers were answered, yes, as sales have been great and I’m constantly hearing from my readers. I am so inspired by them and grateful for the blessings. BBS: One review of Little Divas says, “in the tradition of Judy Blume.” Hearty accolades for a writer. No secret that many YA authors, of all races, credit Blume for the modern day YA style of honest, sometimes brutally honest insight into teens and tweens. However, there’s yet to be an African American “Judy Blume” crowned. Why do you think there’s been no one yet with that same sales record, appeal and recognition? Or is there, in your opinion? Is such an icon necessary to boost Black YA/MG fiction to another level? PMB: I’m always humbled and grateful by the comparisons of my work to Judy Blume’s! As a younger reader (and even still now as an adult), I always adored reading Judy Blume’s books because she allowed her characters to be themselves, no pretense, yet the tone was–at the same time–never gratuitous. As a writer, I also strive to be unabashed but also conscious. Ultimately, I know that kids don’t like corny stuff and I had to let the characters be honest. Paula, this whole “Black Judy Blume” buzz is incredibly inspiring. Besides the reviewers, I often get it from parents of my readers who grew up reading Judy Blume as well. You know though, I must tell you that I’ve never strived to be like anyone in any aspect of my writing. I admire so many writers in addition to Judy Blume, yet I’ve never tried to emulate anyone else’s style or journey. My goal is to be true to my own. God gives us all something different, you know. I’ve always been big on innovation, too. Through all of my career hurdles, it has not been easy (as we both know as women writers of color), but my parents instilled in me to always just keep doing my part–that is working constantly at my craft and conducting myself with Godfearing integrity–and that has been key. That’s really what we should be concerning ourselves with as writers of color–as all writers actually–and just striving to do our part first. We must continue to assertively progress, yes, but also to be anxious for nothing. We, as writers, must center our goals foremost on being excellent in our craft. Too many people think they should just be able to throw a book together and get paid for it and that’s off kilter. What if, when the time came years ago, Quincy Jones had not been prepared to be so amazing in his talent? What if Oprah, when given the chance to begin her career journey, had not been so knowledgeable and spiritually grounded? What if, when given the chance, Present Barack Obama, had been unprepared in his debates? Let us not focus on the opportunities that we–as writers of color–so deservedly desire and will have, but remain steadily focused instead on growing more and more equipped with polished and impeccably well written manuscripts. Because–God bless America–excellence can certainly trump race. BBS: The field remains pretty wide open – what would you like to see happen in the world of children’s literature for African Americans? PMB: I heard Phylicia Rashad in an interview once; she talked about the admirable tone of The Cosby Show and how they didn’t feel, as a production overall, the need to shout and scream about Blackness nor constantly state how proud they were to be Black (and I’m paraphrasing of course) because–quite frankly–it was obvious that they were more than proud. That inspires me, still. So, I’d really like to just see more and more quality children’s literature with more minority protagonists. And I want to see all readers being able to just enjoy and embrace our books as beautifully written and enjoyable stories yet for it to be wonderfully obvious that the author and the characters are proud of the culture in which they represent. We are such an enormously rich culture, so full of untapped potential for stories and books! BBS: Having written for both children and adults – share with us at least one pro and one con to each side of the industry. PMB: Well, the cons are the same and that would be the editorial shuffle. With both of my adult books and then also with my middle grade/tween debut, all three of my editors left prior to the book’s publication. I was fortunate to have each of their editorial talent during the writing process but all three of them were gone by the time we got to the point of marketing and distribution. Those stages in the process without your in-house champion can be a challenge. The pro, with writing for younger readers, is that the kids aren’t so skeptical about trying out a new author. Years ago Eric Jerome Dickey (though he writes for adults) told me that the hardest part for him breaking through to his eventual success was just getting people, potential readers, to give him a chance, to just pick up the book. So, the pro, in this regard, would be that kids don’t have that pretense of hesitation, thinking I don’t know this author so I don’t know if I’m going to give this book a try… They’re the best fans in the world in part because of this and I admire my younger readers immensely. Hmm… the pro with writing for adults would have to be depth of subject matter. Most adult readers have a lifetime of experience that they are bringing with them to the page when they come to read, so that range of emotion therefore makes the writing topics deliciously endless. BBS: What other contributions can we expect from you in the field of children’s literature? PMB: God willing, a lot! In addition to some adult material, I’m finishing up my debut YA (for older teens) that will be released next year in 2010. I’m just hopeful and so grateful and so inspired and truly, truly excited. There is no limit to what God can do, you know, and I keep my faith centered on that, Paula. I do. Little Divas has been such a delight to share with the children in my urban library. I’m happy to say that we can’t keep it on the shelves. Thanks for seeing this gap – and doing something to fill it! Enjoying your series. We are linking your series at Color Online. Thanks for inteviews and book recommendations. I love me some Little Divas and I am still waiting on a sequel. I had a sweet one two combination going with Little Divas and Sugar Plum Ballerinas this past holiday season. When these books sell more will come. Yay Books.